Nothing screams summertime like a day spent floating around in a pool. Installing a swimming pool in your own backyard might seem like a great idea, but unfortunately, the costs can add up quickly. Not only are pools expensive to build, but they're also costly to maintain. 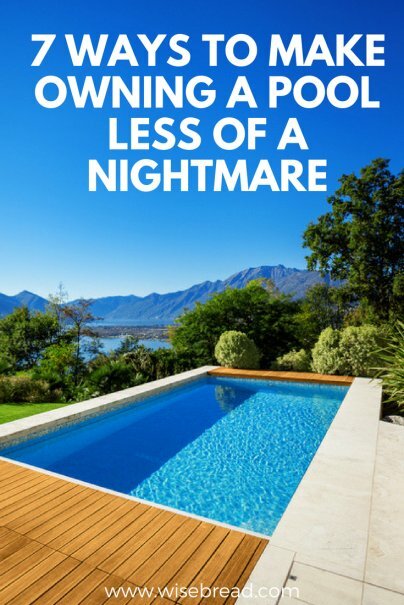 Luckily, there are plenty of ways you can make owning a pool less of a nightmare. Pool covers do more than protect your pool from leaves and other debris. When you don't keep your pool covered, the water evaporates more quickly. In turn, this costs you more money because you have to pay to keep refilling it. A pool cover also helps to warm your pool naturally, so the cost of heating the water decreases. When it comes to pool covers, there is no shortage of options. You can opt to install a flat, automatic pool cover or you can purchase one that you put on yourself every time you exit the pool. Most pool covers cost less than $100, depending on the size and type of cover you need. Either way, a pool cover is definitely a must when it comes to saving you time and money on pool maintenance. Swimming pools require a lot of care and attention. With regular maintenance, you can ensure your pool is functioning efficiently. Maintenance includes keeping the pH levels within proper range, clearing away any algae, and making sure the filters are running smoothly. Scheduled maintenance costs money, but failing to take care of your pool can cost you even more. For instance, failing to skim debris from the pool regularly can clog the filters, costing you more money down the road. To ease the burden of maintaining a pool, you can consider leaving it to the professionals. There are endless local and nationwide companies that will come by regularly to care for your swimming pool. Pools can be dangerous, especially for children who don't know how to swim. Put your mind at ease by installing the proper safety gear and guidelines from the start. Purchasing a pool heater can help extend your pool season, allowing you to get more use out of your investment. Just keep in mind, a heated pool comes at a premium price. For every degree higher you set the thermostat, your energy bill will also increase. To balance out this utility cost, keep the pool unheated when not in use. Invest in a solar pool cover to help insulate your pool naturally. If you're in the initial stages of building a backyard oasis, the most effective way you can lower costs is to decrease the size of the pool. Not only will a smaller pool cost you significantly less to build, but it is easier to maintain, heat, and filter. And you can have just as much fun in a smaller pool. Water features such as slides and waterfalls use an enormous amount of energy. One easy way to save money is to make sure you turn off all pool features when they aren't in use. It's a simple step, but it makes a big difference in your electricity and water bills. You can also save money by turning off your water filter and automatic cleaner. Your pool can still get clean without running these tools 24 hours a day. Of course, every pool owner needs some basic chemicals, such as chlorine, to keep everything clean and sanitary. While it may be tempting to purchase the cheapest chemicals you can find, by doing so, you may be spending more money in the long-run. The cheaper pool chemicals can sometimes be less concentrated, so you end up using more of the product to get the job done. So make sure you check out the concentration levels of pool chemicals before you buy any. And never ever mix chlorine products. This can be extremely dangerous.